With functioning front and rear suspension, no terrain is too rough for the tough quad bike! This great model also features realistic steering and chain-driven engine with moving piston! It doesnt get much more realistic than this! Rebuilds into a race buggy…. With functioning front and rear suspension, no terrain is too rough for the tough quad bike! This great model also features realistic steering and chain-driven engine with moving piston! It doesn’t get much more realistic t han this! Rebuilds into a race buggy. 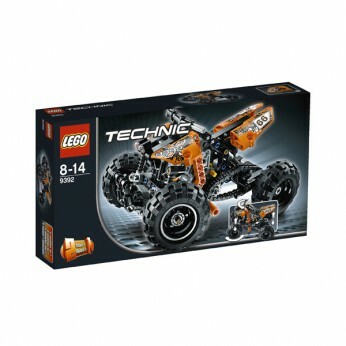 This toy costs approximately £16.99 (for the latest and best prices make sure you check our retailer list for the LEGO Technic Quad Bike 9392 above). In our review of LEGO Technic Quad Bike 9392 we classed it as being suitable for ages 6 years, 7 years, 8 years, 9 years, over 10 years but recommend you check the manufacturer specific advice before purchasing.